I watched Celebrity Juice last night, solely because I knew that Henry Winkler was on the show. Having chatted to him yesterday, I was eager to see how he had fared on the show. He certainly entered into the spirit of things and had no difficulty in removing a variety of bras from a huge manequin in what must surely be record time! I hope that he enjoys the rest of his visit to England. It was an absolute pleasure to make his aquaintance. Goodness me what an exciting day! 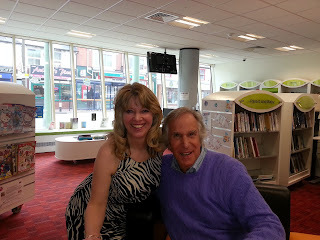 As I have been very involved in the Children's Reading Festival, I was extended an invitation to meet Mr Henry Winkler at Blackheath Library today. Some of you may remember him as The Fonz in Happy Days. I had a lovely chat with him and can confirm he is a very interesting man. I hummed the tune to Happy Days all the way home ! There are seven chapters left to write in Volume IV. Seven! And then a few read throughs and edits and it will be ready to go! I can't believe that 12 months on from publishing my first novel, I am on the brink of completing my fourth. Just think what I could do in a decade! More to the point it makes me wonder what I could have done in the last three decades if I had really put my mind to it. Was I any less dedicated to all the ideas that I pursued then? Was I any less single-minded? Was I more apathetic than I am now? I really don't think so. I think I was just a different person in so many ways and perhaps it wasn't my time to do something like this. But it is now. Watch out for Volume IV : A New Epoch because it is coming soon.